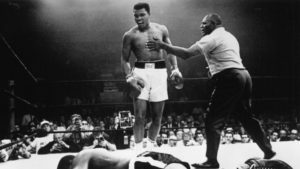 Was Muhammad Ali a Draft Dodger or a Hero? New York Jet quarterback Joe Namath avoided induction because “I have bad knees!” An NFL QB who puts his body on the line every time he goes onto the field? In August of 1964 Bill Clinton registers for the draft. In September he enters Georgetown University. In November he is classified 2-S receiving a student deferment. February of 1968 the Johnson Administration did away with deferments for college students. The same LBJ who kept the war in Viet-Nam going as his wife Lady Byrd received monies for any damaged rubber trees in Viet-Nam as owner in part of Michelin Tires per “About Face” book by Col. Hackworth. August of 1969 Clinton classification changed to 1-D as he nears entering the ROTC at University of Arkansas of which he never entered but to kill draft notice. He goes to UK as a Rhodes Scholar and while there organizes and led anti-war demonstrations in London. He went as far as going to Russia to avoid draft. In 1990 Muhammad Ali flies to Iraq to meet with Iraq President Saddam Hussein. The bottom line was Ali was granted the release of 15 hostages to bring back to the US. If Ali was in the military at the time he would have received the Medal of Honor. His reply was “we ain’t talkin about a baseball team. We talking about you!” Me? I spent 2 miserable years at Ft. Jackson, SC, and fought with the rednecks the whole time until release. Then in October of 1967 went “from the frying pan into the fire and got married! 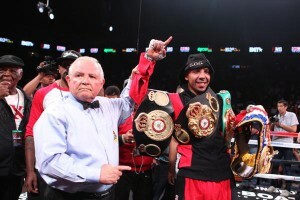 Why The Dislike For Andre Ward? He’s risen above his tough origins. He’s a sound family man. He never makes a scene in public. And he’s one hell of a good fighter. Still, there’s a lot of dislike out there for light heavyweight kingpin Andre Ward. Why that is, however, is a question worth asking. Some time ago, HBO personality Max Kellerman stated that Ward wasn’t popular because he basically didn’t play into the bad boy role such as contemporaries Floyd Mayweather and Adrien Broner had. There may have been some truth to that, but “nice guys” such as Ray Leonard and the second version of George Foreman were popular despite the smiles on their faces. Then again, Leonard and Foreman came from different times. This is the era of the big mouth, after all. Heavyweight behemoth Tyson Fury and MMA star Conor McGregor are, along with Broner and Mayweather, more par for the course. Being humble just doesn’t cut it these days. Or does it? Until very recently Manny Pacquiao, who has always come across as smiling and modest, was extremely popular. Perhaps he was the exception, however, as more conservative types like Tim Bradley and Mikey Garcia, although well liked, don’t draw in the attention the rogue warriors do. Errol Spence, though, may be well on his way to enormous popularity. The same goes for Anthony Joshua. And they’re both seemingly nice guys…who are also great fun to watch. Perhaps that’s what it all comes down to, really….being fun to watch. Except for the fact that Floyd isn’t really fun to watch. For some, his fights are more like works of fine literature – rewarding and very well worth your time – but challenging to get through. Sure enough, Floyd’s “Money” persona may make up for an actual LACK of ring excitement. If you’re starting to feel this all gets confusing, you’re not alone. The truth is, for every argument you make for Ward’s low approval among fans, there’s a counterargument waiting to shut you down. Think his reputation is harmed because he doesn’t act like a punk? Anthony Joshua is no punk. Think people are turned off because he’s not explosive in the ring? People pay millions to watch Floyd cruise to decisions. Think Ward is disdained for being openly Christian? Foreman’s openly Christian, and – even in retirement – remains one of the most beloved figures in the sport. What exactly IS it about Ward that rankles people, then? This writer sees all kinds of accusations tossed against the man regarding various offenses. Some of them may be spot on, but none seem to warrant the deep dislike people seem to have. For what it’s worth, one of the charges against Ward is that he’s a diva. Word is the man, or at least his camp, is extremely hard to do business with. That sort of thing can be genuinely off putting. Ward’s opponent this Saturday, Sergey Kovalev, also makes it clear that he feels Ward’s camp is less than fair in it’s treatment of he and his team. If so, that’s another good reason for people to feel animosity. Ultimately, though, it’s a bit odd that Ward, who appears to be a genuinely unassuming type overall, is seen in such a negative light. This is a sport, after all, where people say and do terrible things, where arrests, PED busts, and antisocial antics occur far more frequently than they should. In light of all that, it may be that Ward is viewed a bit too harshly by his critics. But perhaps there’s more to it than meets the eye of this particular writer.